When Frank Sinatra calls you ‘One of the major singers of our time’ you know you’re doing something right. And it’s fair to say that Jack Jones has been getting it right for over 60 years. And now, to celebrate his 80th birthday, Jack Jones returns to the UK in January to play 14 dates across the country. A professional singer since 1957 and one of the world’s original and best loved crooners, not to mention star of musical theatre, TV and film, Jack Jones has won accolade after accolade. The recipient of two Grammy Awards (with another five nominations) and an Emmy, he has performed at two Royal Variety Shows and has over 60 albums to his credit, 17 of which have charted in Billboard’s Top 20. He has clocked up 32 Top 50 hits in the Billboard AC chart, including three No 1s, and he even has his own star of the Hollywood Walk of Fame. He has had massive hits with numbers such as ‘The Impossible Dream’, ‘Wives and Lovers’, ‘Lollipops And Roses’, ‘Call Me Irresponsible’, ‘If You Ever Leave Me’, ‘Lady’, ‘The Race Is On’ and the theme to the enormously successful US hit TV show ‘The Loveboat’. Although his parents had been in showbiz themselves, it wasn’t a given that Jack would follow in their footsteps. ‘I think they’d much rather I’d have been a doctor or a lawyer” he says “but my mind was made up”. Jack’s professional debut was a brief stint as part of his father’s act at the Thunderbird Hotel and Casino in Las Vegas, when he was just 19 years old. He went out on his own three weeks later, working odd jobs to support himself while pursuing his singing career. His first break came when a demo he recorded found its way to Capitol Records. Although he left Capitol after a few singles and an album, one song – ‘This Could Be The Start Of Something Big’ - caught the attention of a San Francisco club owner, who booked him for a three week run. He was discovered by Pete King, a producer and artist for Kapp Records, who quickly signed him to the label. Jack was still working at a petrol station when his first album on Kapp was released. He recalls “I was washing a windscreen one day when I heard one of my songs on the radio. I remember thinking maybe I can give up the day job now!” Jack went on to release a further 21 albums with Kapp before switching to the RCA label in 1968. With a catalogue of some of the best loved international hits of all time to draw upon, it sounds like it will be just that. Jack Jones plays The Apex in Bury St Edmunds on Friday 26 January. 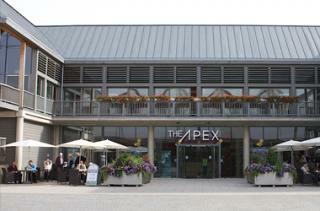 Tickets are available now from www.theapex.co.uk or the venue’s box office on 01284 758000.